Sometimes on Friday evenings, I watch CBS's prime-time hit series CSI:NY on television. 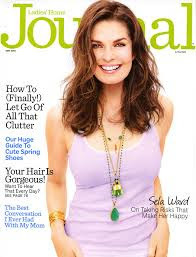 I love crime shows and one of the other reasons I like to watch it is Sela Ward, an award-winning actress who plays a very cool, straight-to-the-point detective named Jo Danville. In real life, Ward is a busy mother of two children and a wife as well as a career woman. Yet she always gives off this aura of being calm, collected and totally together; something I am constantly working towards. This month she landed beautifully and professionally on the cover of Ladies Home Journal magazine where she gave an interesting interview about taking risks in life and being open to unplanned opportunities that life may spring on you. I love Ward's honest attitude towards life and being courageous in your actions. She's not afraid to admit to making a mistake or putting herself out there in an untested way. She picks herself up and continually starts over again. That takes a lot of guts! While she talks in the interview about her determination with regards to acting, I think her philosphy of grabbing life and going full throttle can easily be applied to myself and anyone else out there trying to find a new direction in their life or just trying to discover new ways to make their life work in a healthy and creative way. Q: LHJ: Isn't it funny how we make plans for our lives, but so much occurs by chance? Ward: Yes, but there's a drive that makes you keep moving forward -- and connects you to other people. If you sit at home all day long or play it safe or say "I'm not going to go to that," then you don't meet those interesting people who can change your life. You have to open yourself up to the world. I open myself up to possibilities all the time. Q: LHJ: In what ways do you keep moving forward, in your personal and professional life? Ward: When I was on Sisters, I'd be so bad some weeks. I'd take a risk with a scene and fall flat on my face. But I'd pick myself up, work with my acting coach, go back the next week and then be kind of good. Of course the following week I'd fall on my face again. I did this for six years. By the time I was finished there wasn't one scene or script that I was afraid of. I have that same attitude about life. I know how to put in the hard work, I know what I don't know and I know how to figure it out. Q: LHJ: Are you always thinking about what's next or is there part of you that is able to sit back and enjoy the here and now? Ward: I try to live my life in the present. If you think in terms of "This is it," not "Things will be better in my next lifetime," the choices you make are different. For me right now it's about living my life in Technicolor. There are so many opportunities and possibilities all around us. Even though I'm not in that "35 and under" relevant category anymore, I've still got a lot to offer -- I've still got a lot I want to do. Living our lives in Technicolor. . . Isn't that a great concept? Sela is so wise! Hi! My name is Mary Kate. My blog is about working your way through grief by staying healthy, strengthening your support system and being resilient. I am a widow, mother, former journalist and dancer. I miss my husband but I am embracing my journey wherever it takes me. Please "like" my Facebook page and become a follower. Thanks!